A lot is going on all around us today. Unfortunately, most of it is very disturbing. Switch on TV or sign in to your social media accounts and you will see or hear sad and scary real-life stories happening every single day. Not just that our own lives are full of trials and temptations. Jobs on the line, family disputes, health problems, business failure, are some of the things we go through. As Christians, we need to live the way Jesus lived on earth. He said we would have trials and tribulations. So that means all the things that steal peace from our hearts will always be there one way or another, but we have to know how to handle them. Despite the challenges, Jesus faced, one of the things that made Him standout was the peace he had. For example, He was peaceful when people insulted Him, when they wanted to push him off a cliff he slipped away peacefully, Jesus slept in the middle of a storm, and when they tried to stone him, he peaceful walked away in their midst. Jesus had the peace that surpasses all understanding. The good thing is you can choose to have that same peace of Jesus in your heart. Worrying never takes your problems away. It only steals your joy and peace. Life has its ups and downs. You can never wait until everything gets better to live peacefully. The world has come up with different systems and ways in which people can find peace. But most of the methods are temporary solutions. You need something substantial, and that is the peace of Jesus. What are you going through right now? Are you letting the peace of God reign in your heart or are you busy looking for temporary solutions? Here are things you should do to have the Peace of God. Recognize that God is the true source of peace. Get verses about peace and study them. Meditate on these scriptures until they become alive in your heart. Then ask God to help you in whatever season you are in. Stand firm in the word of God and believe that he has heard you and has filled your heart with peace. God will never fail you. You have to believe that everything will work out for your good in the end. Defend your peace because the devil will try his best to steal it from you. There more you focus on what is happening the more distracted you become and it leads to anxiety and depression. Shift your focus from the things that are happening in the world and fix your eyes on Jesus. 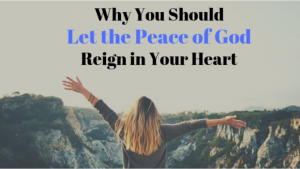 You have to let the peace of God to reign in your heart. God will not force it on you. When things seem to be working against you, choose to rest in the finished work of Jesus and let God’s peace rule your heart, let God make everything beautiful at the right time. This is a beautiful article! I’ve been struggling to find peace these last few months. I think God is telling me something with this article. God bless you!